The bride and groom preparation are the most intense part of the wedding day and on the couple's special day at Liberty Grand, that was no different. On one hand, the couple is happy to get married and express his emotions of joy. On the other hand, there are also concerned about any potential issues that might appear on the big day. During the groom preparation I always try to keep the members of the bridal party engaged so that I obtain the right reactions and capture candid moments. In such a competitive industry, the Toronto wedding photographer has to be not only an amazing visual artist, but also possess outstanding people skills that allows him to control the sometimes rowdy bridal party. As you can see, wedding photography is not only about taking stunning photographs, but also encouraging the couple on the wedding day so that they feel like models comfortable in front of the camera. I am not saying everybody is able to juggle such difficult tasks but in order to a successful in the Greater Toronto Area, one needs more than just beautiful photos. With the ubiquity of Internet and smart phones, long gone are the days when the wedding photographer in Toronto had no competition. These days the whole world is a potential competitor. That is particularly true for the artist specialized in destination wedding photography. Even when it comes to products such as the wedding album, the artist is facing a very intense competition from websites like Shutterfly, Bride Box and so on. Couple that with a strong decline in the demand for wedding albums in the get a clear picture on the industry trends and the impact on the photographer's profit margins. That is the reason why, many studios spend more time in social media than on processing the photos. The engagement photography session is a joke nowadays in my opinion. The photographer is taking the couple long location somewhere in the GTA and delivering 30 to 40 images. How can the professional wedding photographer compete with large studios that offers significant discounts to the couples by bundling the engagement, wedding photography and videography in a package. The little artist is often force close shop despite its love for the craft. Sadly, the most successful Toronto wedding photographer studios do not always deliver the highest quality for their couples. A way to defend the business for the boutique studio in the greater Toronto area is to create a distinctive photography style that makes the images stand out. If perspective couples can identify signature portraits, the artist is safe. However, today, with the event of cheap, smart cameras, everybody is a photographer. Truth be told, I have seen cases where the moments captured by the guests or better than opposed images created by the professional wedding photographer. Not to mention the fact that many professionals are in fact glorified guys with the camera who have no idea how to create beautiful portraits of the couple and their guests. I remember during one of my first weddings that one of the bride's nephews was using a DSLR throughout the event. Towards the end of the big day, his father saw me a few shots and I was floored. Admittedly, the kid's keeper rate was low but those photographs were better than those of my second shooter. Interestingly enough, during family portrait session, the kid was shooting over my shoulder and his images looked almost as good as mine. Imagine this four year old in 10 years will have shot a few million images and would put the professional photographer to shame. 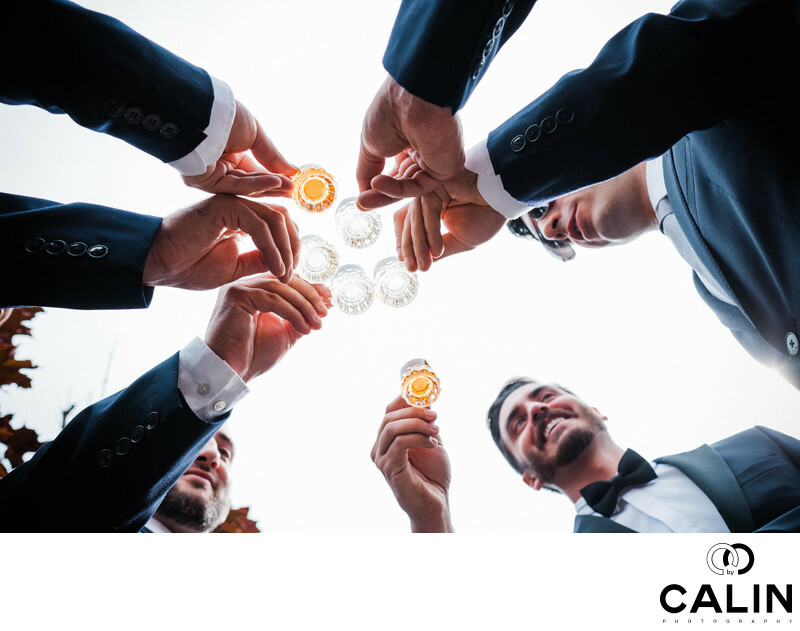 Coming back to our shot, the image is depicting the groomsmen having a drink. Makes this image special is the interesting vantage point from which it was taken. To create this photograph, I was literally lying on the floor shooting upwards. The multitude of hands holding classes is creating a series of leading lines directing the viewer's attention towards the subject of this photograph: the drinks. The groom is positioned in one of the corners of the image and his face is the only one visible here.